I absolutely LOVE salvaging eggplants, they have quickly become one of my favorite vegetables to experiment with and discover, this dish came together quickly and easily and left both Mike and I feeling quite content and satisfied! In a large skillet, heat about 2 Tbsp. Olive Oil over medium-high heat, add 2 Eggplants worth of cubes, saute about 10 minutes until tender. If needed, add additional olive oil. Saute 1/2 of a chopped Onion with eggplant for about 5 minutes, add 2-4 cloves, minced garlic, saute another 2-3 minutes. Add 6 diced Roma Tomatoes to the skillet, reduce heat and cook until tomatoes are tender and break down slightly. Mix the eggplant sauce with the pasta seasoning with salt and pepper and additional olive oil if needed. 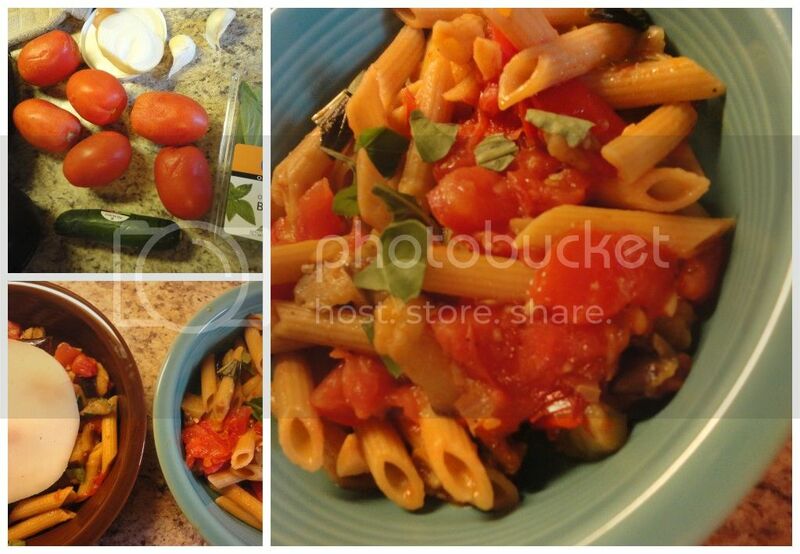 Tear fresh Basil and sprinkle over pasta mix, top with your choice of Italian cheese, enjoy!